New Zealand links or web sites might be useful if you intend to search online for items, services, and information online. So if you are from overseas and intend to stay in New Zealand, e.g. a hotel in Auckland City, then visiting NZ or Auckland specific internet sites might be necessary if you require relevant information. I have attempted to provide useful (hopefully relevant) NZ internet links that may be of use. The links can be viewed at my web site (www.pcsourcepoint.netfirms), near the bottom of the home page. If you are planning to reserve a hotel, then searching online for entertainment, travel, outings, etc, are important as are possible major road works, or events, which might have an impact during your accommodation in the city. Hence it might be wise to search online, and check with your hotel, for any possible planned disruptions or events when booking accommodation. Examples of Auckland information sites can be found at (http://www.auckland.co.nz/ about shopping, site seeing, events, major roadworks, etc), (www.aucklandnz.com relates to attractions, guides, travel, and more), Queen Street Online (www.queenstreet.co.nz) - Auckland City's main road, of which many of the City hotels are situated or are adjacent, has links to events, bars, restaurants, business, services, and more. There are numerous other sites pertaining to Auckland, and just require searching with your relevant search terms, for example on Google Search. Image of Auckland Sky Tower By watford at SXC. But if you want more general NZ information, perhaps download these useful New Zealand internet sites and other NZ sites. They are in word format, and have links to popular and government NZ sites (e.g. Seek (for work), Trademe (Auctions), NZ Customs, NZ Tourism, and more). Visit New Zealand Links for more comprehensive categories (http://www.benz1.com/), and NZ directories (e.g. yellow.co.nz, nzs.com, ubs.co.nz). Maybe the NZ top 50 could be useful (http://www.nztop50.co.nz/). Perhaps your hotel's internet access may be configured to display popular or useful NZ links, but may pay to ask what internet access costs are (if any). 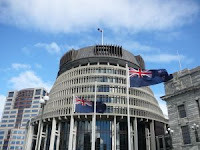 Image of the Beehive - New Zealand's Government Parliament By twinkledee at SXC. But do ask management or staff at your hotel if you need information, or items, as they are likely to inform you of the easiest, and quickest source or online site for further information. Perhaps compile, bookmark or email to yourself links of Auckland and New Zealand links (and your own frequented sites) for later reference. Hence it should be relatively straight foward to find hopefully relevant information, with Google search (including local). Remember to use Google maps/street view, news, blog, and image search for a more enhanced search experience. Image of the Auckland Viaduct By severes at SXC. Related post: Auckland Luxury Hotels - How to Search Online (Segmented searches with Google's "Wonder Wheel").